Posted on September 24, 2014 at 5:16 pm. Office space is at a premium in densely populated areas such as New York City. Historically, a 1000-square foot storage room was needed to house the large volume of SJ’s customer documents. eMazzanti Technologies created a network solution that supported the digitization of SJ’s files. Reclaiming the work space reduced the need for additional expensive space as the company grew. SJ requires access to customer data and documents while visiting with clients and on the road. “eMazzanti provides us with the technology in order to be able to have access on the go as well as storing everything and making sure it is there when necessary,” stated Weissbrot. With eMazzanti’s Premium eCare service, any SJ employee may call the eCare helpline anytime for any sort of technical assistance that they need, such as setting up a printer. Because SJ specializes in the jewelry industry, the precious metals and gems handled by their clients represent a very high-value inventory. This makes the security of confidential information like client contact information and banking relationships essential. 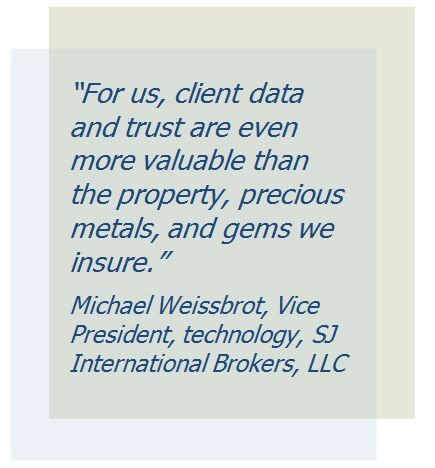 “For us, client data and trust are even more valuable than the property, precious metals, and gems we insure,” stated Weissbrot. As SJ’s business and network have expanded, their proactive eCare service has kept them up-to-date. eMazzanti technicians monitor reports and make improvements to their IT environment as needed. “Over the years it’s evolved to cover us for our servers, our continuity devices, as well as keeping our entire office on the cutting edge of technology in order to best service our industry,” summarized Cruiser. SJ International Brokers, LLC, located in New York City, NY specializes in all forms of insurance for the jewelry industry. Clients include some of the largest jewelers in New York City and other international venues.